Democrats are screaming about every Republican who has ever talked to a Russian official. Meanwhile, we present to you “Coffee Break Throwback,” starring Leftist kingpin Schumer and Russian big wig Putin. There hasn’t been this much excitement over Russia since Reagan called on Mr. Gorbachev to “tear down the wall”. Those words ended the Cold War. Now the mere mention of Russians sends Leftists into a tailspin. Everyone is worried, Leftists imply. Did Trump talk to Putin? But this little pow wow between Schumer and Putin has been all but forgotten. 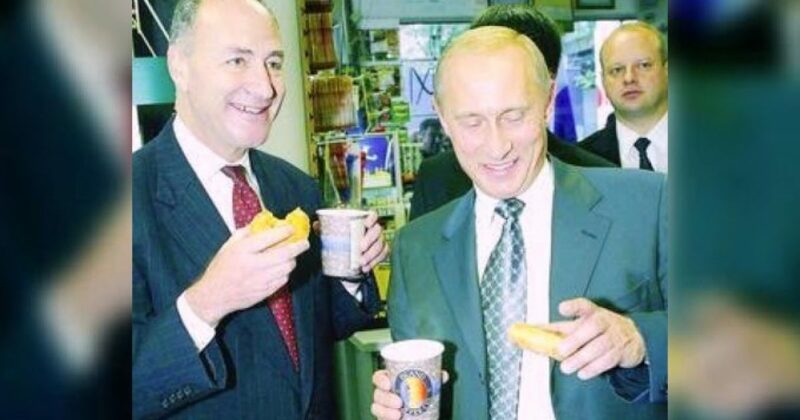 Putin and Schumer met to share a Krispy Kreme at a New York gas station. It was the first station opened by Russian company Lukoil. Is there anything wrong with the two of them eating a doughnut together? Not really; such is the world of politics. Politicians meet. They cross paths, and occasionally they even join forces and share photo opportunities. The only real problem is the Left’s ability to discount their interactions with the Russians. Let’s get real. Attorney General Jeff Sessions and former NSA Michael Flynn aren’t the only politicians to ever meet a Russian. As we reported yesterday, Claire McCaskill served on the same committee as Sessions. She, too, met Russian officials. Chuck Schumer Putin: What about this tantalizing revelation? Once again the Left move faster, because the travel on the double standard. Leftists openly meet with the Russians, knowing that they have no interesting in what’s best for America. But they take credit for trying. Remember when Obama said this about meeting with rogue nations? President Trump as a candidate declared he would meet with Russia. When did this ONE country become the one that all others should avoid? Under the Trump administration, that’s when. At some point during the campaign, Leftists felt the best strategy was to “blame the Russians.” They then attempted to tie them around President Trump’s neck in hopes the allegations alone would kill his campaign. What nonsense! Barack Obama said he would meet with “rogue” nations, and the Left didn’t complain.